From left to right: Lock and Shock masks are bent to begin shaping. Aluminum foil/scraps of cardboard are used for noses. Eye buildup is done in Barrel after first layer of paper dries. Teeth are inserted in cardboard spacing. After looking at pictures of Lock and Shock (devil and witch), take a pencil and draw an outline of the masks onto the flat cardboard. Make sure to add a 1/4″ edge line to the outer sides (see image below on right). Draw their eyes, nose, mouth, and creases for under the eyes too. Take the 8″ paper plate and draw the eyes/mouth/nose for Barrel (Even though mouth will be covered shortly, drawing all features will help keep perspective). Using the razor knife, cut out Lock/Shock from outer line mark(edge line) of each mask on cardboard. 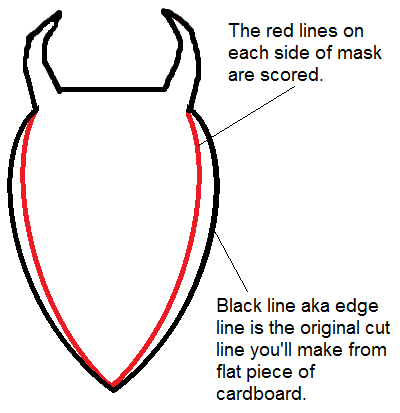 Then score the inner edge line so it can bend easily, but NOT detach from mask. The creased sections will help with a 3D look to your mask. Cut out the eyes/nose holes of Barrel on the paper plate. Bend Lock and Shock inward slightly to start the shaping process (see image above, right). If cardboard is not staying bent, use masking tape in back to hold it in place. Cut out a piece of leftover cardboard in shape of Lock and Stock’s nose. Use masking tape to keep in place. Add aluminum foil as needed to strengthen or shape nose. Cut various size pieces of brown paper (you’ll need at least 100 pieces of approx. 2″). Mix equal parts of white glue with water into bowl, mix well. One at a time, dip a paper strip in glue mix, wring off excess, and cover cardboard. After the first round of covering strips with Barrel (round paper plate) and drying, build up his eye sockets with masking tape. It is much easier to do the build up if plate is less flexible. Slightly build up nose bridge/under eye areas with folded glue strips. Cover each mask with strips at least 4 times, drying in between. Add more masking tape for edges, cover with strips. Cover the back with glue strips at least once before adding anchors. To make the back anchors for the ribbon to hang from later, bend a piece of floral wire into a 1/2″ loop, twisting ends (will look like a flower petal), repeat. With hot glue gun, place a dab of hot glue on the back of mask, between inside edge and eye on both sides. Push a loop in each glue dab and hold down with a pair of scissors, or something to prevent getting fingers from getting burned. Make sure the loop is not engulfed in hot glue – just its twisted tip, and is free to be stringed later with ribbon. 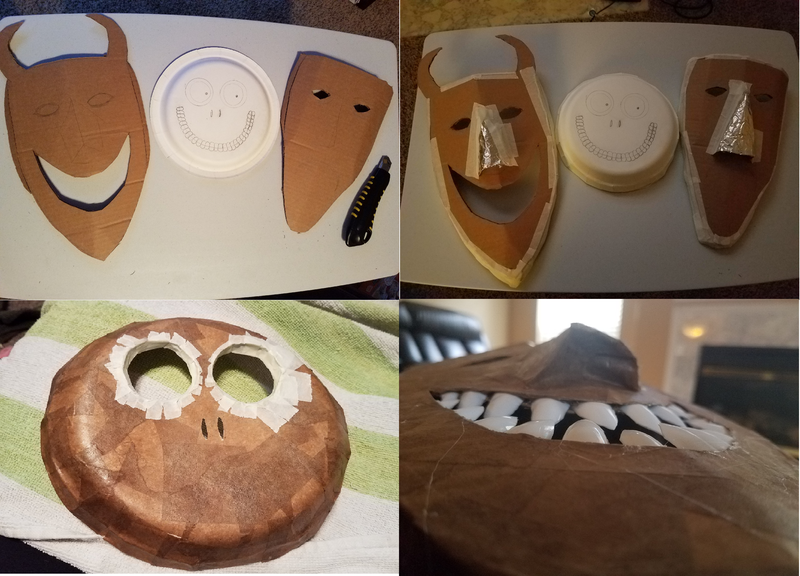 After the loops are secure in all the masks, cover a layer of glue-paper over the hardened hot glue spots and let them dry. Working on Lock (devil): Notice the angles of his teeth in images and cut the same angle in the artificial fingernails (using scissors). Slice in between the layers of cardboard/hardened paper along Lock’s lip line, cutting deep enough to push the nails into the space like gums in the mouth. Dab each spot with hot glue, push nail into spot and repeat all around. Let cool. Paint mask red, at least two coats. Working on Shock: Paint entire mask dark green, at least two coats and once dry, use a black Sharpie and add lines around eyes and mouth. Working on Barrel: Choose white or light blue (I’ve seen both versions) paint to cover his mask. Paint multiple coats until uniform color covers well. Again with pencil, draw mouth to give a guide to using a Sharpie later for the teeth. Paint a light layer of yellow over penciled teeth marks. They will still show through in one coat. Take the Sharpie and follow your pencil marks still seen to make the teeth. Use black paint and cover the inside eye sockets. 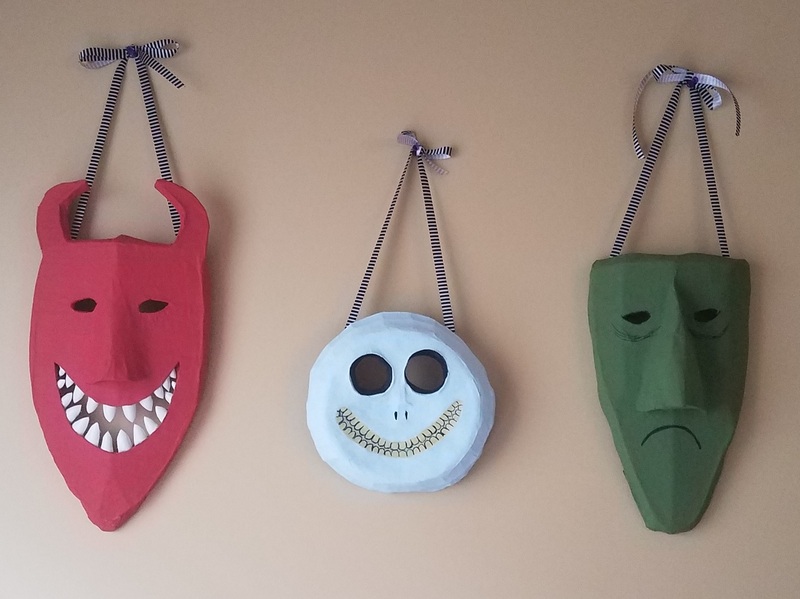 Now all three are ready to be strung up by ribbon and hung on the wall or used for a mask to a costume. Tip: Don’t panic if you get some paint on Lock’s teeth while covering him with acrylic red. Simply take a tooth pick or wooden shish-ka-bob stick and scrape off dried paint and it comes off easily. Please feel free to email or comment your questions and I’ll get back with you ASAP. If you tried this project, please send your pics so everyone can admire your work. This entry was posted in Costumes, DIY, How-to-Make Ideas, Props, Seasonal Decorating and tagged Barrel, DIY, Lock, Masks, Nightmare Before Christmas, Props, Shock, Tutorial/Directions by thewritegirlforthejob. Bookmark the permalink.